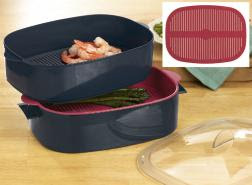 I receive a lot of emails from various Tupperware customers asking me for recipes that they can use with their Tupperware Oval Microwave Cookers. Here are a few that you can make that are easy and quick. Place artichokes, onion and chilies in the Quick Chef with blade, turn handle until ingredients are chopped. Add mayonnaise and Parmesan cheese; turn handle until well mixed. Spread mixture in base of the Oval Microwave Cooker, cover. Microwave on high for 3-5 minutes or until hot. Serve warm with crackers or tortilla chips. Scrub potatoes, cut into 1" cubes, rinse again. Stir together vegetable oil, onion, garlic, parsley and chicken pieces in base of the Oval Microwave Cooker and cover. Microwave on HIGH for 5-7 minutes or until onion is transparent. Stir in broth and pepper. Spread potato pieces evenly over bottom of shallow colander; place on top of base with chicken and broth mixture. Cover. Microwave on HIGH for 5-9 minutes or until potatoes are fork tender, stirring occasionally. Stir potatoes into chicken mixture. Cover. Microwave on HIGH for 2-4 minutes or until potatoes are fully cooked and coated with parsley mixture. Place broth, wine, pepper and rice in Base of Oval Microwave Cooker. Place chicken in Shallow Colander and place on top of base. Sprinkle top side of chicken with seasoning. Place Deep Colander with Floor inserted on top with vegetables. Cover. Microwave on HIGH for 5 minutes. Turn chicken over; sprinkle top with more seasoning. Cover. Microwave on HIGH for an additional 5-7 minutes or until chicken is cooked.